Entertaining at home should be a time to relax and enjoy family and friends. There is no need to stress out over all the details of your party that can make it work instead of fun. No matter the occasion, The Party Staff’s experienced professionals can handle every aspect of your home event. 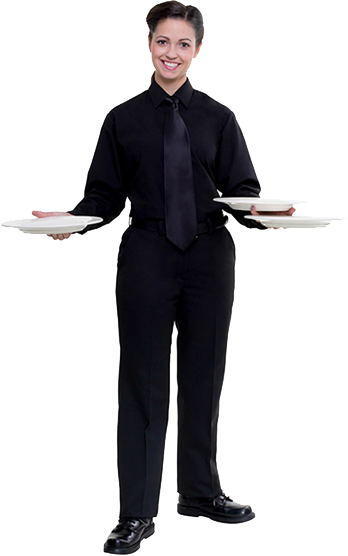 Need to know what bar supplies to buy, how to staff your party, or what the correct place setting is for a formal meal? Here are some guidelines you will find helpful for your next home party. These lists are to be used as a guideline. If you are familiar with your guests preferences, you may need to add or delete items from this list. *Be sure there is a waterproof trash can near the bar. A cardboard box lined with two plastic bags works well for this purpose. *Note: 10 ounce bottles or 12 ounce cans are preferable. Plastic one or two liter containers go flat very quickly after being opened. For 100 guests, you will need approximately 150 pounds. You will need more if you plan to chill your beer and wine on ice or if you will be serving blended drinks such as daiquiris or margaritas. During warm months, increase ice by 25%. These staffing suggestions are meant to serve as a general guideline. These staffing suggestions are meant to serve as a general guideline. Please contact your nearest Party Staff representative who will be happy to assist you in determining your specific event staffing needs.